The former leading man, now 67, appears in two small indies opening this month: THE DINNER, in which he plays a congressman involved in a scandal, and NORMAN, in the titular role of a political fixer, or what my Yiddish-speaking mother would call a “macher,” a guy who knows everyone, trades favors and exploits connections. 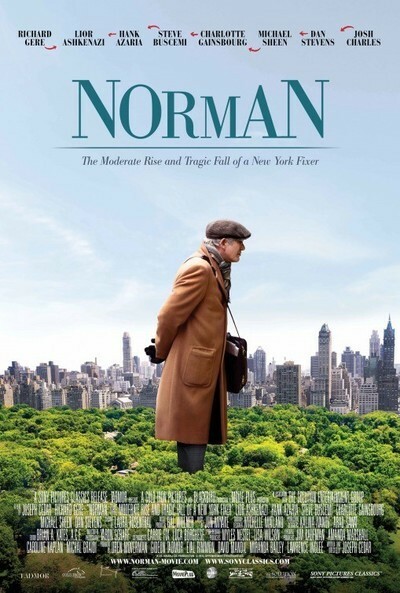 The full title makes it sound like a novel: Norman: The Moderate Rise and Tragic Fall of a New York Fixer. Its literary aspirations are suggested by the film's division into four acts: “A Foot in the Door,” “The Right Horse,” “The Anonymous Donor” and “The Price of Peace.” Financed with Israeli money and written and directed by Israel-born Joseph Cedar, the movie tells the story of Norman Oppenheimer, the persistent but enigmatic New York hustler — his business cards say he's a “consultant” — who finds himself entangled in an Israeli political scandal. We quickly get a sense of how Norman, a gray-haired man in rimless silver spectacles, tweed driving cap and a camel-hair coat, operates. He's ingratiating, a fast talker who won't take no for an answer. He approaches a political staffer during the man's regular jog in the park, and persists through the man's objections (“This is my private time!”). Norman's long-suffering nephew compares him to “a drowning man trying to wave at an ocean liner.” Norman replies, “But I'm a good swimmer.” There are echoes in Norman of Arthur Miller's Willy Loman. Compare, from Death of a Salesman, Willy's wife Linda exhorting her son: “Be loving to him. Because he's only a little boat looking for a harbor.” In his indefatigable persistence, he's also a little reminiscent of Tony Curtis' Sidney Falco in Sweet Smell of Success. Norman makes a crucial connection when he espies Micha Eshel (Lior Ashkenazi), an Israeli deputy minister in New York for a lecture, longingly eyeing a pair of shoes in the Lanvin boutique window on Madison Avenue. Norman introduces himself and chats him up while Eshel, who believes his political fortunes are on the decline, tries on suits and the coveted shoes. Despreate to ingratiate himself, Norman impulsively offers to buy Eshel the shoes — unaware that they cost over twelve hundred dollars. (Recounting the incident later, he says, “Best investment I ever made,” because of the valuable connections it produced). Norman, the man at the center of the story, is a cipher. Many of the stories he tells as part of his sales pitches involve a wife, now dead, and a daughter. But it's unclear whether Norman ever married, where he's from or where he lives. All we know of his personal life is that he has an attachment to his synagogue, where he likes to listen to choir rehearsals (“It relaxes me.”). In a welcome bit of odd casting, Steve Buscemi plays the synagogue's Rabbi Blumenthal, whom Norman promises to find a donor for the $14 million needed to save the synagogue from demolition. For a skilled operator, Norman is surprisingly clueless. He unwisely reveals the workings of his business to an attractive Israeli justice official (Charlotte Gainsbourg) he meets on a train. For his indiscretion, he is swept into a bribery scandal that threatens to bring down Prime Minister Eshel. Gere creates a compelling, sympathetic figure of the shrewd but hapless Norman, the fast talker with a lonely core. Even though Norman has wheedled his way, uninvited, into a fancy dinner party one night, we can't help but feel bad when he's thrown out the back door for failing to produce his promised guest, Eshel. And Eshel, sensitively played by Ashkenazi, also seems lonely, drunk-dialing Norman from a hotel room after standing him up for that dinner party. It's a small story, nothing terribly consequential, but the film has considerable flair, incorporating multi-screen techniques, clever use of mirror and window reflections, and other techniques not commonly seen in modern Hollywood films. Director Cedar, cinematographer Yaron Sharf, editor Brian A. Kates, and the rest of the cast and crew deserve praise for this modest triumph. 3 1/2 out of 4 stars.